2011 was an extremely busy year for the council. We traveled across the province on the Ontario Organics Roadshow, kicked off several research projects, helped launch the Foodland Ontario Organic logo, started the Marketing Ontario Organics Working Group, participated in several conferences, attended many meetings, launched our social media outreach, developed several key videos about organic, engaged an organizational sustainability study, and much more! Meeting with Deputy Minister Burke to discuss priorities, policy, competing claims and the value of organics. South-Western Ontario Farmer/ Buyer Networking event in London. 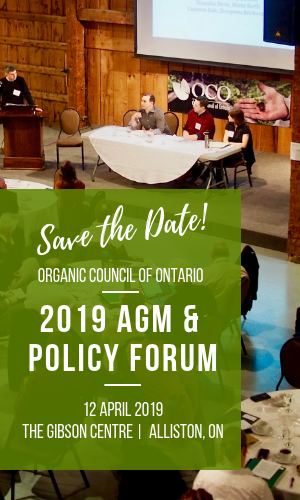 Media Coverage of Member business growth w/ OCO quote: “Over the top organics” Farmers Forum, May, 2011 “… we’d like to see that there’s some policy in place that the polluter pays.” – Jodi Koberinski, OCO ED. Meeting with Agriculture Minister Carol Mitchell to discuss our sector’s issues ahead of the July Meetings of the Federal/Provincial Ministers in PEI. OCO participated on the OVCRT Marketing Working Group to develop the Phase II activities for promoting the Canada Organic brand, including consulting on a survey for operators. Participate in OFC, SIC and Technical Review Committee activities: Ted Zettel participated in OFC meetings. Addressed regulatory issues arising from critical variances with the US Organic program. Media Coverage of Organic Sector w/OCO interview: “2011: A Tough Year for Organic Farmers ” Better Farming Magazine, October 2011 . Meeting with Conservative MP Ben Lobb (Huron Bruce) re: Financial support for standards upkeep; low-level presence; and financial support for transitioning to organic. ‘Certified’ Label issue discussion with COTA, COO. Position statement issued. Sector-Wide efforts to shift story on Organic Apples being found with small amounts of fungicides, including interviews with CTV. Worked with COTA, COG, and OFC to develop counter-story. Succeeded in shifting story to be about how we live in a polluted world and the best solution to minimize toxins is organic.